A chrome-rich variety of pyrope. 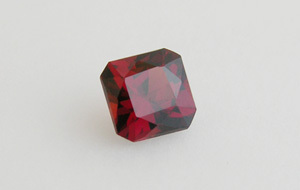 Also called ‘anthill garnet’. In the State of Arizona, USA, these are found around the anthills. The ants meet the garnets while digging their underground passages, drag them to the surface and discard them. 2 specimens: 0657 — 0.14 ct, USA, Arizona, Apache County, Navajo Indian Reservation; 0289 — 0.37 ct, USA, Arizona, Apache County, Navajo Indian Reservation.